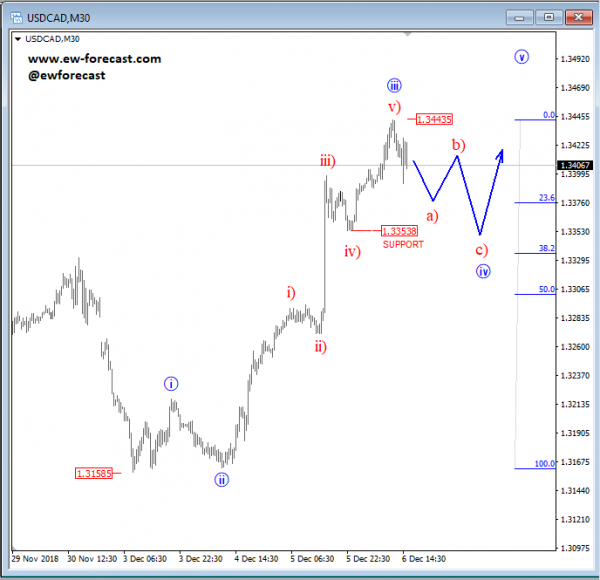 USDCAD unfolded a five-wave rally within wave three as part of an unfolding bullish impulse. This five-wave rally in three can be an indication of where the trend is likely going, and we expect it to slow down, and make a minor correction. This correction can be a wave iv, which can later look for support and a bullish reversal near the 1.335/1.330 region, from where final wave five can follow. Trading forex, futures or futures options carries a high level of risk, and may not be suitable for all investors. The possibility exists that you could lose some or all of your initial investment; therefore you should not invest money that you cannot afford to lose. Our website and the information provided here should not be relied upon as a substitute for extensive independent research before making your investment decisions.